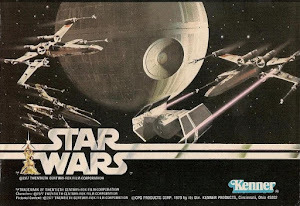 A regularly updated blog about my vintage Kenner Star Wars toy collection. Some stuff that I've recently acquired; some stuff that I've had since I was a kid. Some rare, some common, but all sharing the warmth, charm and character of the "first generation" of Star Wars toys - the ones we played with as kids in the late '70s and early '80s. ...which brings us to the toy that was the subject of the commercial, the Hoth Wampa. Originally boxed as simply "Wampa", the toy's packaging was later branded "Hoth Wampa", I guess to put it in context... as if the dead Tauntaun, Luke in Hoth outfit, and snowy landscape didn't do that already. While the toy's sculpt has come in for some criticism, I happen to like it. The other main issue people seem to have with the toy is its tendency to turn yellow over time. It's tough to find a nice white one, for sure. On to the recreation of the box art! Unfortunately these less-expensive toys tend not to have amazingly intricate play tableaux, but we can only work with what we have, I guess. Here's the Wampa slappin' a Tauntaun upside the head. Lifting Luke overhead preparatory to a power bodyslam! 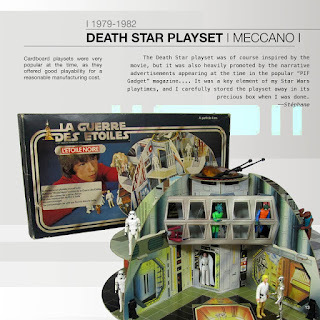 In any event, what we have here is the Sears (direct) version of the Jabba playset. This box version wasn't generally available in a true retail sense - I understand that it was what you got when you catalog-ordered the item from Sears. The box itself is pretty plain - two-colour litho, and the same image on the front and back of the box. There's nothing printed on the top and bottom nor on the end flaps. And here it is! The string on my production toy is obviously much shorter than on the version used for Kenner's photography, though. A few words about the "action" feature of the playset (yes, "feature" is singular). The two "outboard" decorative "heads" along the front of the base are connected to the platform pieces on top of the base. When the heads are rotated, the two sections of the platform rotate upwards from the edges, as shown above. "One look into his glassy eyes and kids will know - JABBA THE HUTT means business!" And when Jabba means business you get dumped in the pit. Some sculpted detail there - bones, lizards, detritus from past victims, etc. Copyright info on the bottom of the base. "Made in... who the %^&@ knows?" As with many Kenner playsets, the Jabba set contains what seems to be an inordinate number of small parts... in addition to the base, there's the hookah stand, hookah bottom bowl, hookah chimney, hookah top bowl, pipe and string, slave collar and string, and the Jabba and Salacious Crumb figures. Yikes! As I've mentioned before on this blog, a big part of retaining one's sanity (and financial solvency) as a vintage collector is establishing what you will NOT collect. For me, my collecting dead zone has always included the toyetic representations of vehicles that were never shown on-screen in the original trilogy (I'm looking at you, Mini-Rigs). However, fortunately for me, Kenner released some really cool toys during the Empire and Jedi periods that hit the Mini-Rig price point, but represented some essential items that actually DID appear on-screen. I'm going to cover these in the next few blog posts, and the first one up for discussion is the Radar Laser Cannon. Of course, this is the crew-served weapon used by the Rebels on Hoth to defend Echo Base from the Imperial attack at the beginning of The Empire Strikes Back. Note that this is not to be confused with the "other" radar laser cannon that was packed into the Hoth Ice Planet Adventure Playset! This one is much more detailed and has a cool "blow apart" play feature. The one that came with the HIPAP is a one-piece toy, is smaller in size, and is not designed to come apart in any way (except permanently if, for example, your little sister smashed it to pieces). The "Action Figure Accessories" range is shown on the box side. All from the Empire film, strangely enough. You can make it "esplode"! The two box sides shown above illustrate the unusual features of this packaging - it's tri-logo! In the picture above we see the English logo, with French and Spanish shown in the picture below. On to my favorite bit - the replication of the box art. Pretty straightforward this time, with only two Rebel Soldiers crewing the Radar Laser Cannon. Copyright information is on the bottom of the toy - notable in that copyright date is 1982, a rather late release for ESB toys. However, in addition to being released in an ESB box, the toy was issued in 1983 in RotJ livery branding, and presumably the Tri-Logo packaging shown came out with the rest of the Tri-Logo stuff in 1984.
trilogo.info hosts a ton of information about Tri-Logo packaging on carded figures, playsets and vehicles, but unfortunately doesn't have any info on these "accessories". I've emailed Joe, the creator and administrator of the site, to see why this might be, and I'll update this blog with anything relevant I find out. Stay tuned to the blog for more Accessories! Inspired by the latest episode (56) of the Vintage Rebellion podcast, I got out the old Rancor monster for a photo session. And what a monster he is! Easily the largest creature in the Kenner line, he's packed with play features as well, as you can see from the box photos above. Movable legs, wavy arms, rotating wrists... and most importantly, the snapping jaws! Here we see Luke running towards (!) the Rancor, who's already nabbed an unfortunate Gamorrean Guard. Here we have the image from the box front... Rancor has switched the Gam Guard from right hand to left, in order to free up his right hand to grab Luke. I said "his"... and apparently this is correct; even though the Rancor's name is "Pateesa," it's a male rancor. The point here is a closeup shot of the control button for the Rancor's jaw action. Release and they snap satisfyingly shut! Can't say much for the standard of dental care at Jabba's palace either. Copyright info is hidden away on the back of the leg. Had to include a couple of shots with the Rancor Keeper, of course. Apparently the backstory on Pateesa is that he was a birthday gift to Jabba from his majordomo, Bib Fortuna. "Don't say I never got you anything!" But on that point, I don't think a large, vicious animal requiring significant resources to upkeep is really an appropriate gift. I feel the same way about giving someone a puppy. "Thanks for this gift... that I now have to feed, housetrain, clean up after, pick up the droppings of, and provide medical care to... for the next 8-12 years. Yeah thanks again." Hey - dogs are great. But unless you live in the same house with the recipient, or the recipient begs for you to get them one, don't give one as a gift. At least the Rancor served a useful purpose for Jabba by disposing of unwanted slave girls. Anyway... I never had a Rancor monster in my childhood collection and honestly, until I got this one out for pictures, I never fully realized how cool a toy it is. The snapping jaws are just great and the toy is really huge! I think the original pricetag on my box was $16.99 though which is plenty for even a very large figure. But the sculpting detail is outstanding and the play value has to be there in this one. Earlier this year I was contacted by my friend Stephane Faucourt, who asked if I would be willing to offer some help with the English edition of his new book, "Star Wars - 40 Years of French Culture." 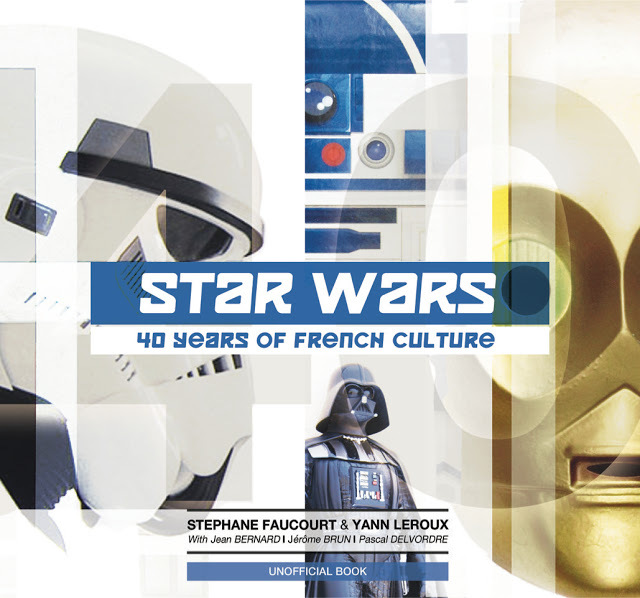 We'd gotten to know each other when I helped Stephane a couple years back with some translation and editing on his seminal book on Star Wars in France, "La French Touch." Well, I was happy to help out, and I was pleasantly surprised to find a copy of the new book in my mailbox shortly after. The book is great and I highly recommend it to fans of vintage (and modern!) "foreign" promotions and merchandise. The format of the book is conversational, with Stephane and his collecting friends sharing their recollections of the toys, model kits, books, promo items and other French licensed stuff from over 40 years of the brand. 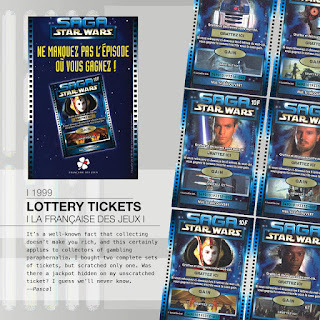 There's a great variety of items featured - everything from Meccano action figures, to Super 8 films, to video games and other amazing stuff, based on the original trilogy, the prequels, and even the new Disney films. A (metric) ton of content, with great photos and descriptions. The book is highly recommended of course - you can find it here on Amazon. Makes a great holiday gift! People in collecting hobbies talk all the time about "Holy Grail" items... meaning the type of item that comes along extremely rarely, is usually very expensive, and is highly desirable as a centrepiece of a collection. This piece, for me, is a Grail item. The Tatooine Skiff was produced at the very tail end of the vintage era, was released only in "Power of the Force" packaging, is rare, is expensive, and (just look at it!) is amazingly cool. I obtained this item is several transactions earlier this year. The vehicle was acquired from one dealer, an original spare part to replace a damaged bit of the vehicle from another person, the box from a third, and the original vintage Planetary Map from yet another! The package design on this box is just wonderful. The play features are great, including retractable landing gear, movable thruster vanes, collapsing side rails, and of course the extending gangplank! Great pic here of some figures on the Skiff. We can clearly see the "lateness of the hour" in terms of the vintage era from the inclusion of Barada, one of the last 17 POTF figures. Before we get to the ship itself, let's have a look at another inclusion with the toy - the Planetary Map. Interestingly, the Planetary Map wasn't referenced on the box as an inclusion, and probably made a nice surprise for the original purchaser who found it in the box. The obverse of the Map has all sorts of interesting information about the planet Tatooine. 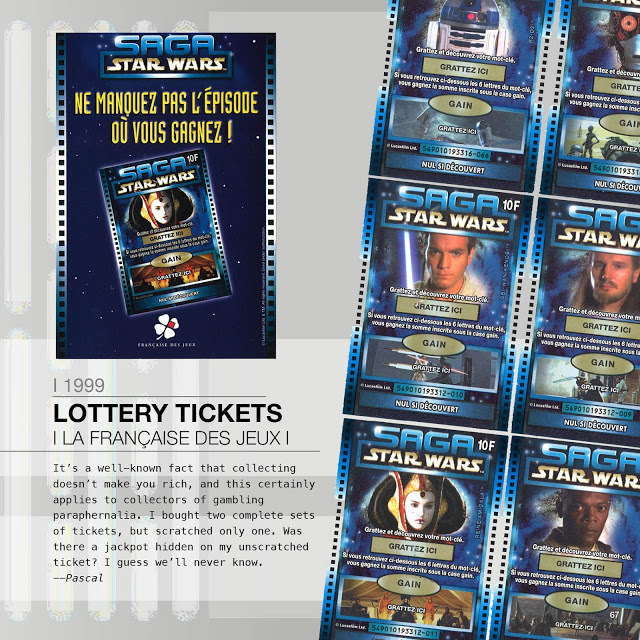 The reverse contains promotion for other toys in the later range, including the awesome Droids A-Wing Fighter! Perhaps a Droids cartoon aficionado can weigh in as to whether the vehicle appeared in the cartoon, but we know that there was unproduced art for a Droids-branded box. Luke, for his part, looks around nonchalantly, waiting for his lightsaber to come flying towards him, no doubt. A disarmed Chewbacca is guarded by Boba Fett while Weequay mans the controls of the Skiff. Luke takes a tumble as pictured on the box. Followed by Boba Fett... unfortunately the railings aren't strong enough to support a "halfway down" shot like on the box. Copyright info confirms this example as a 1984 PotF item as opposed to a reissue. Unfortunately the original vehicles were comprised of some very fragile parts - notably the side rails and landing gear struts. I believe that those parts on this ship have been replaced by identical parts from the reissue - not "reproduction" per se as the parts are from an identical toy, but not 1984 production. Weequay demonstrates the operation of the Skiff's controls. Lever at the left of the picture operates the landing gear. Careful operation is a must as you can feel the delicate nature of the gears inside as you move the lever - yikes! Lever at right works the "drop-down" function on the gangplank. Operator's eye view of the Skiff controls. I also picked up a very nice laser-cut acrylic stand for the Skiff from an eBay seller. Great if you want to display the item as it saves stress on the landing gear. Well there you have it. Grail acquired. I have to say it's great to finally have picked this one up. Not an insignificant investment either... although acquiring a toy, box, and insert separately usually costs more than buying them all together, I think I did OK with this transaction and didn't significantly overpay. The problem with the Skiff is that so few seem to have survived either in box or completely original. I'm happy with this one and it's satisfying to have added it to my modest collection. (c) 2013. Trademarks used are the property of their owners,no challenge to their status is intended. Awesome Inc. theme. Theme images by sololos. Powered by Blogger.